In the ufology magazine Lumières Dans La Nuit #138 of October 1974, Miss Carof gave the result of her investigation into an previously unpublished case of the year 1954 in France. She indicated that on November 5, 1954, around 4 a.m., Raymond Mansard, then 23-year-old, was riding a motorcycle on the departmental road D. 15 under a cloudless sky. It was very dark, the moon was down since 0:57 a.m. He came from Chevincourt and was going to Ressons-sur-Matz; he went beyond the place called "Moulin d'Elincourt" when his attention was attracted by a luminous object that followed a path parallel to his. The object was about 100 to 150 meters away and at an estimated altitude of 15 meters. Mr. Mansard saw the craft behind the trees of the marsh bordering the little river Matz. Its shape was very visible on the hill that rises beyond the marsh. It looked like an inverted bowl, slightly flared down with a flat bottom. It flew too close to the trees for the witness to distinguish the underside. Its outline was clear. It was flame-colored, orange yellow, but did not light the environment. It seemed to turn on itself in the clockwise direction. Its diameter is estimated at 4 meters and its height at 2.5 to 3 meters. The witness did not hear any noise except that of his motorcycle which was traveling at about 60 km/h; he varies its speed from 40 km/h to 110 km/h, but despite this maneuver the craft remains at its side following the Matz. He traveled about 2.5 km and then reached Margny-sur-Matz, where the object was hidden by the houses. He left the village of Margny and looked again on his left but saw nothing. The observation lasted about 2 minutes. There was no effect on the operation of the engine and the lighting of his motorcycle. Mr. Mansard was very impressed and woke up his family to tell his parents about his adventure. On November 5, 1954, around 4:00 in the morning, Mr. Raymond Mansard, then 23, was riding a motorcycle on the departmental road D. 15; the sky is cloudless, it is very dark, the moon that will be new on November 7 is under the horizon (set at 0:57). He comes from Chevincourt and goes to Ressons-sur-Matz; he goes beyond the place called "Moulin d'Elincourt" when his attention is attracted by a luminous object that follows a path parallel to his. 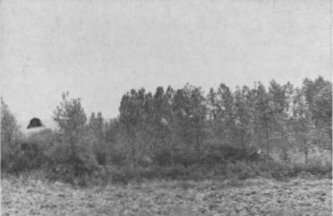 The object is located about 100 to 150 m away and at an estimated altitude of 15 m. Mr. Mansard sees the craft behind the trees of the marsh bordering the little river Matz. Its shape is very visible on the hill that rises beyond the marsh. It is presented as an inverted bowl, slightly flared down with a flat bottom. It flies too close to the trees for the witness to distinguish the underside. Its outline is clear. It is flame colored, orange yellow, but does not light the environment. It seems to turn on itself in the clockwise direction. Its diameter is estimated at 4 m and its height 2.5 to 3 m.
The witness does not hear any noise except that of his motorcycle which is traveling at about 60 km / h; he varies his speed from 40 km/h to 110 km/h. Despite this maneuver the machine remains at its height following the Matz. He travels about 2,500 m and then reaches Margny-sur-Matz. The object is obscured by the houses. The observation lasted about 2 minutes. He leaves the village of Margny and looks again on his left but sees nothing. Mr. Mansard is very impressed and wakes up his family to tell his story to his parents. It should be noted that during the observation there was no effect on the operation of the motor and the lighting of the motorcycle. Mr. Mansard also points out that a similar observation has been made by one of his friends. The two authors indicate that on November 5, 1954, at 4 o'clock, in Ressons-sur-Matz, an object shaped like an "overturned bowl, slightly flared downward, with a flat bottom", was seen. The sources are given as "L.D.L.N., #138 p. 15." The events are so similar to a misinterpretation of the Moon that I thought it would be worth to check if Mrs Carof was really correct about the Moon being set. Location: On the Departmental Road 15 going from Chevincourt to Ressons-sur-Matz after the place called "Moulin d'Elincourt" and going to Margny-sur-Matz. The blue circle surrounds the marshes south of Moulin d'Elincourt, the blue line indicates the river Matz. The coordinates of Moulin d'Elincourt are 49° 30'51 '' North, 2° 49' 24'' East. Miss Carof was right about the Moon: it is at the azimuth 290° 56'(West-North-West) but at 28° 43' below the horizon, not visible. It set at 00:53 a.m.and will rise again at 02:38 p.m. I considered the day to be the "5" - such a precision would seem to indicate that the day has been duly remrmbered, but the month might have been wrong. But the Moon was not visible either on September 5th, October 5th, or December 5th. One can of course decide that the date would be totally false and that the real date would be at a time when the moon would explain the observation; it would be an ad hoc decision. It is obvious that Miss Carof thought of the moon; which is why she undertook the verification. For me, the story of the observation is really suggestive of the low red moon (color) with a cloud hiding its lower part, hence the "saucer" or "British helmet" shape, the apparent path "parallel" to that of the motorcycle, and the change of apparent speed of movement corresponding to the change of speed of the motorcycle. Thus I would bet on a date error by the witness. The apparent clockwise rotation of the object an be explained by scattered small clouds of mist or fog passing between the Moon and the witness. [ca] "Enquête de Mlle Carof", dans le magazine d'ufologie Lumières Dans La Nuit (LDLN), France, N° 138, page 15, octobre 1974. [fr1] "OVNI, Premier Dossier Complet des Rencontres Rapprochées en France", book by Michel Figuet and Jean Louis Ruchon, Alain Lefeuvre publisher, France, pp 209-210, 1979. 0.1 Patrick Gross December 3, 2018 First published.